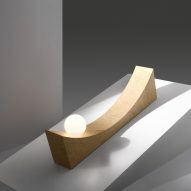 Child Studio's precarious lights appear to be "frozen in time"
Set for display at Milan design week, Child Studio's In the Shadow of a Man collection features globe-shaped lamps that perch on bases as if precariously off-balanced. 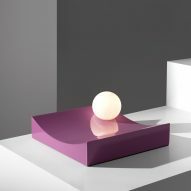 The lights appear to have been caught in the middle of sliding or rolling down wooden plinths of various shapes and sizes. London-based Child Studio, which was set up by Chieh Huang and Alexey Kostikov earlier this year, designed the lamps to appear "as if frozen in time". 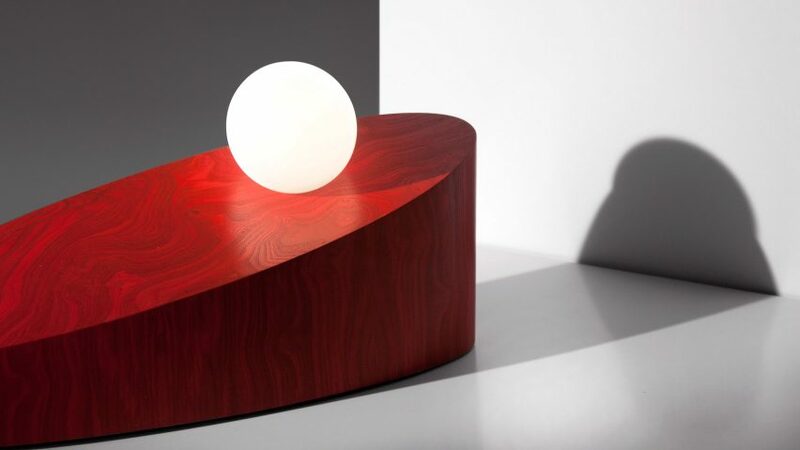 According to the designers, the lighting references the surrealist paintings of Giorgio de Chirico, and the work of experimental theatre director and artist Robert Wilson, who also often works with surreal imagery and sets. "The ambiguous scale and striking silhouettes of the pieces give them an architectural quality," said the studio. 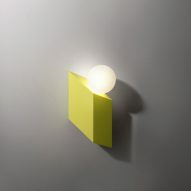 "The project invites the viewer to pause and to reflect on their perception of time within the physical environment." 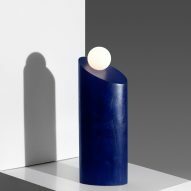 "The collection is intended to create a surreal and otherworldly experience when placed in any setting, although possibly the more eccentric spaces will add to them as objects." 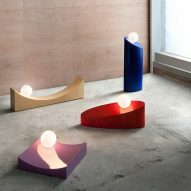 The pair used coloured and lacquered ash wood for the lights' bases, which include sloping circular plinths and scoop-shaped supports that the lamps appear to be rolling into. Each base features a different finish, with some revealing the underlying grain of the wood and others polished to a high gloss. The entire collection will be shown during Milan design week at the Ditta Angelo Radaelli flower shop in the Brera district, from 4 to 8 April. The pair chose the space for its "untouched" interiors and will display the lighting collection surrounded by plants. "It was important for us to find an authentic and interesting way to present our work in Milan as the design week is dominated by big brands," they explained. "It is getting hard for independent designers to participate and show their work so it was essential we found somewhere unique." 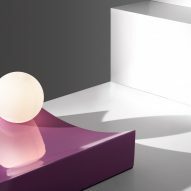 Other lighting on display during the festival includes a loopy pendant made from pearlescent glass by Bocci's creative director Omer Arbel and several new collections from Tom Dixon, including a pendant that casts a kaleidoscopic reflection when turned on.